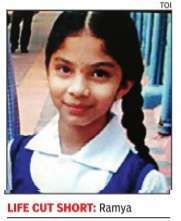 Nine-year-old Ramya, who succumbed to injuries sustained in a road accident near Chutneys on Road No. 3, Banjara Hills, on July 1, was buried at a graveyard at Amberpet on Sunday afternoon. “My daughter, who was the light for for our lives, is no more.What has happened to us should never happen to anyone,“ said Ramya's father Venkataramana, a software engineer. For their part, police said they had `strong evidence' and would seek maximum punishment for a 20-year-old engineering student who caused the accident while driving under the influence of alcohol. Ramya's body was shifted from Care hospital, Banjara Hills, to Osmania Hospital after her mother Radhika, who was told about the tragic death only in the morning, saw her. Radhika, who had also suffered injuries in the accident, was admitted to another hospital and family members had not informed her about her daughter's condition all these days.